I started my career in 2005 as a painter and decorator and now have 10 years experience. During this time I have worked on both residential and commercial developments branching out on my own to start my own business in 2015. I gained my decorating skills working on supermarkets and retail outlets throughout the country in partnership with JJ UK Ltd, but have also completed many private residential houses in this time. Our aim is to provide a high standard of commercial and residential decorating services to achieve ultimate customer satisfaction at affordable prices. 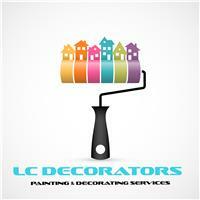 LC Decorators carry the appropriate insurances and all work is fully insured. At LC Decorators we provide a range of internal and external decorations within Gloucestershire, South Wales, Oxford, Bristol and Swindon areas, offering painting, decorating, paint spraying, special paint effects dry lining. We have a small team of experienced decorators, who hold all the relevant H&S certificates such as, IPAF, Asbestos Awareness to be able to carry out the required works in a safe manner. No job is too small, and our projects range and can be anything from painting one wall to a large house to a complete house to commercial supermarkets. We take the utmost care when working in residential properties to ensure the work is carried out as efficiently as possible with minimum disruption for the residents or employees. Quality finishes and high levels of standards are adhered to at every stage of your project, attention to detail is of the highest importance. We aim to achieve a finish that you would be proud of. We listen carefully to your exact requirements and offer guidance where needed, a friendly approachable service, we are here to help you every step of the way. If you would like us to provide you with a free, no obligation quotation, or just wish to discuss a forthcoming project, then please do not hesitate to contact me.